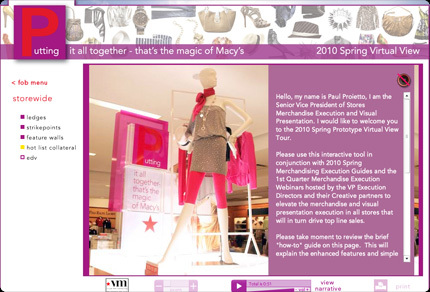 In our second virtual tour for Macy’s stores, we sought to provide users with same in-depth, virtual viewing experience as our first tour as well as introduce some new features for increased functionality. In this season’s tour, we added an anonymous login feature that allows managers to track tour visitors from various regions across the country and receive valuable feedback upon these visitors’ exit. All of the content of the tour is based on XML feeds, and our efficient update system allows users to make fast, easy corrections to the tour in a matter of minutes. 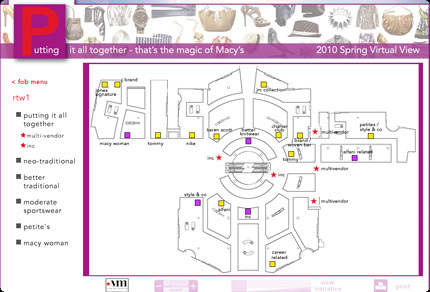 Interactive maps were another valuable add-on to this tour, and users reported the maps as very helpful in navigating store levels within the virtual tour. Each of the store levels in the tour has an instructional narrative to accompany the visuals. If a user prefers not to listen to the sound, the “View Narrative” function will recall the text of the audio. “Volume,” “Pause/Play” and “File Length” were additional add-ons that increased the functionality of this tour. A tracking tool within the tour collects extensive feedback on the number of visits, average time of stay and unique individual feedback from users regarding usability, fun and their overall rating of the tour. Based on feedback provided by over 25 percent of visitors to this tour, the average rating for each of the aforementioned categories was an average of 4.75 out of 5. Over 70 percent of visitors spent more than 20 minutes on the site, and the tour had nearly 22,000 hits during its first month of operation.